Audi is intensifying its mixed material usage for its next-generation A8. Like rival BMW and its carbon core construction, Audi is out to prove it’s come up with the perfect combination of materials for the optimal blend of low weight and high strength. The new A8, which arrives later this year, as a 2018 model, will arrive with a spaceframe body structure composed of aluminum, steel, magnesium, and carbon fiber-reinforced plastic (CFRP). Most notable is the use of CFRP in the rear panel, contributing 33 percent of the total torsional rigidity of the A8. Par for the course is the use of high-strength steel to make up the area surrounding the passenger cell. 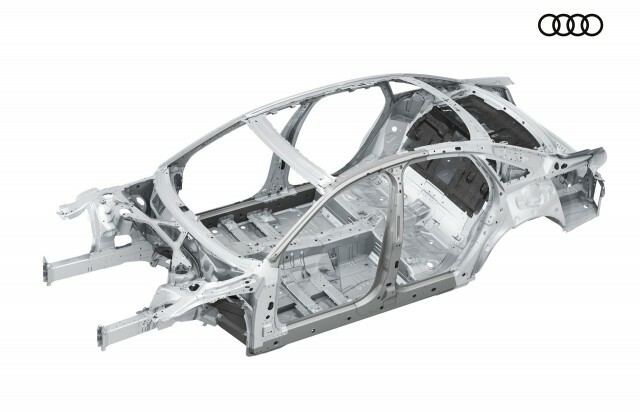 With lightweighting on its mind, Audi has gone through the trouble of applying the steel in varying degrees of thickness through what it calls a “tailoring technology.” The end result is stronger, more lightweight components where needed, especially in areas critical to occupant safety. But, it’s aluminum that does most to keep things light in the anew A8. Around 58 percent of the body structure will be composed of aluminum, while the addition of a magnesium strut brace contributes to a 28 percent drop over the current A8’s component. The mixed material usage comes to a crescendo in the halls of Audi’s main plant in Neckarsulm, Germany. It’s here where the new A8 will be assembled with equipment specially built for the production of the flagship sedan. Energy and production efficiency were underscored when developing the necessary tools and techniques for the latest spacefame, which includes 14 different processes to join the materials together where they meet. While of this is good, Autocar reports that the final weight figure isn’t likely to decrease. In fact, the spaceframe will reportedly weigh in 112 pounds heavier than today’s A8. Also making the new A8 heavier will be alternative powertrains and their batteries. 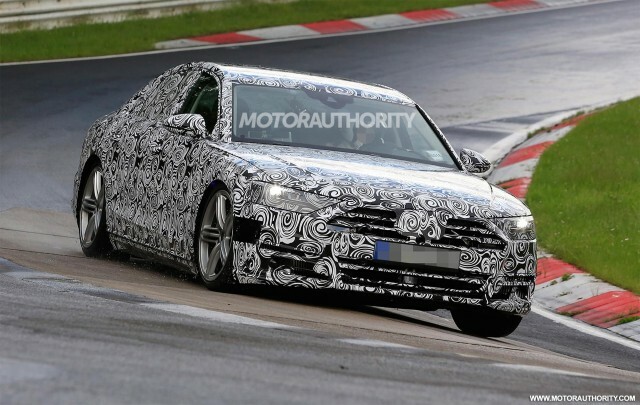 We most recently captured spy shots of the A8 testing and it looks as if all of the mixed material engineering underneath will give way to a handsome skin inspired by Audi’s series of Prologue concepts. The debut will take place on July 11, 2017.